Anuket - Goddess of the Nile River. - Egyptian Goddess. Anuket She Who Embraces Anqet Anukis is the personification and goddess of the Nile particularly at Elephantine. 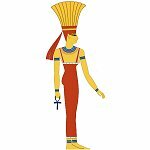 Home ¦ Divinity of the Day ¦ Egyptian Gods and Goddesses ¦ Anuket - Goddess of the Nile River. Anuket - Goddess of the Nile River. Anuket ("She Who Embraces") (Anqet, Anukis) is the personification and goddess of the Nile, particularly at Elephantine. She is part of a triad of gods with Khnum and Satis. She was depicted as a woman with a headdress of feathers. A temple dedicated to Anuket was erected on the Island of Seheil called Amen-Hery-Ab - Amen's Heart is Content. A river procession in honour of Anuket occurred during the first month of Shemu. During the Festival of Anuket, at the start of the Nile floods, people threw coins, gold and jewellery into the river, in thanks for the life-giving water. She is also a goddess of the hunt and is sometimes depicted as a gazelle. The Greeks associated her with Hestia, a goddess of fire and the hearth.